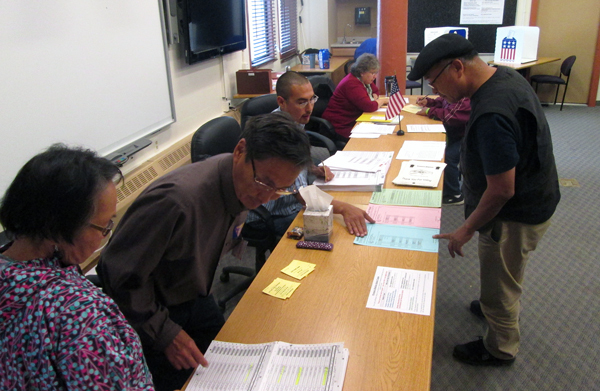 Voters at the Lower Kuskokwim School District choosing primary election ballots on Tuesday, August 19th, 2014. The state of Alaska is proposing several changes in how they deliver voting information to Alaska Natives whose first language is Yup’ik or Gwich’in. The state is offering the changes after a federal judge issued a decision in a voting rights lawsuit last week. U.S. District Judge Sharon Gleason ordered the state to better help voters who speak Yup’ik and Gwich’in understand their ballots. Bakalar explains, the state is preparing different versions of ballot language to send to tribal councils and outreach workers to reflect different dialects. She says they’re looking for feedback from speakers. Oscar Alexie teaches Central Yup’ik at the UAF Kuskokwim campus in Bethel and has also worked on Yup’ik translations of ballot materials for the state. He says that most bureaucratic language used to explain ballot measures and other choices on ballots, simply does not exist in Yup’ik. In addition there are several regional dialects of Yup’ik, which lack the specificity needed, making ballot translation next to impossible. Alexie says the best situation would be to have translators from each community reading the ballot to Yup’ik speaking voters, because Yup’ik was only recently codified in the last generation or so, so most people will understand best, if they hear the translations, rather than read them. state already provides that service and will be doing more to promote it’s availability under their plan. Alexie says he worries about The possible negative impacts of the lawsuit on language translation in the state. He makes his point by comparing the division of elections and their translators to a dog team. He says you can expect a lot from a dog, they’re hard workers and they like to pull but they can only do so much, especially in the short period of time leading up to the November election. The state of Alaska and their translators will be moving quickly, they want to have the changes made in time for the November election. The plaintiffs, Alaska native speakers from Southwestern and interior Alaska, being represented attorneys from the Native American Rights Fund, have until Wednesday to respond. Then Judge Gleason will issue an order telling the state what they need to do. Judge Gleason has not yet ruled on whether the state intentionally violated voter’s rights on the basis race or color.